KIM KARDASHIAN VIDEO AFTER PARIS ROBBERY! Chill, or nah? New video has surfaced, showing Kim Kardashian after the Paris robbery, is seen inside her apartment. This is right after thieves reportedly put a gun to her head, bound and gagged her, and stole over $10 million in jewellery from her! There are several police officers and detectives, all over the luxury hotel suite. In the video below, you can see Kim sitting calmly in a couch, using a cell phone. Maybe she was speaking to her husband Kanye West, or maybe her bestie, Jonathan Cheban? I really feel for Kim, but it is weird (and amazing) at how collected she looks. I would be staring and listening to everything going on. Maybe using the phone is her way to stay Zen. I wonder who’s phone she’s using, since hers was reportedly stolen? The video also shows her assistant, sitting across from her. She is also on a cell phone. As well, many different Paris officials can be seen moving around, talking, and working. The video footage shows two doors, with no visible damage, or sign of forced entry. 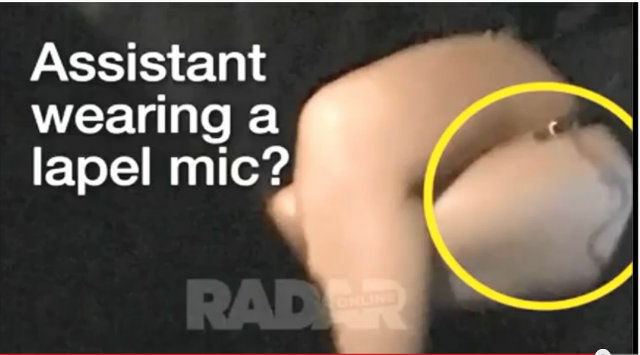 There is also an image of Kim in a car, which show her wrist with no visible bruises, which zip ties often cause. Of course, none of this proves anything, to those of us that weren’t there. However, this last picture, is for me, the most disturbing of them all. Sitting in the car with Kim, her assistant is wearing what looks like a microphone taped to her thigh. This type of microphone is used during taping of reality shows, like ‘Keeping Up With The Kardashians‘. Is it possible that Kim is taping the aftermath of her horrible $10 million robbery, to be aired on her show? Could anyone be that tasteless and money hungry? And who’s holding the camera in this video? And WHY? Now watch the video below to see the details for yourself! Get your Protest Gear- BEFORE TRUMP BANS THIS TOO! Perhaps Kim Kardashian will give an interview to explain all the details. Maybe for the right price? Either way, leave a comment below, and tell me what you think! Also, please SHARE, LIKE and SUBSCRIBE! Thanks. See you on the next one!